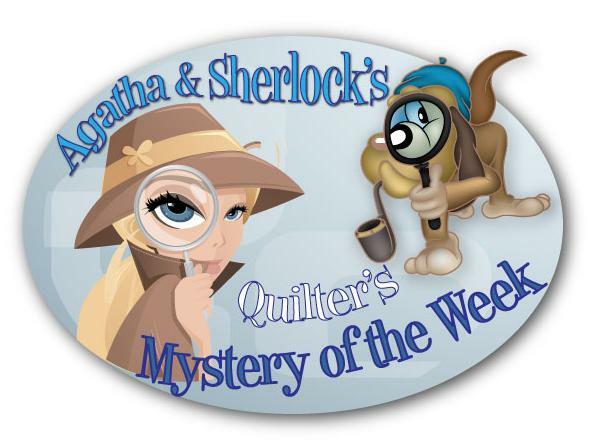 Join Agatha and Sherlock as they help you unravel the clues to make a gorgeous, quick, and fun quilt! ... and you are going to love how easy it is for you to solve a mystery! Click Below for Information about any Upcoming Mysteries. On the first week of the program, you will receive your mystery fabrics, cutting instructions and your first clue. Each week (Tuesdays) we will mail out your next clue (the next step in your mystery quilt), and in 12 weeks or less, you will complete your quilt ... with just 1 hour or so spent per week! This is perfect for quilters of all skill levels, for those of you who have so little time, and for anybody who just loves a mystery! This is an ongoing program, and the mysteries will begin at the beginning of month. You can join for any or all of of the mysteries. However, you will need to sign up for each mystery individually, and may do so at any time as long as they are available. We recommend you sign up early to get the theme or color way of your choice. Each Mystery has 2, 3 (or 4 on special occasions) different color ways or themes- choose one or choose them all. If we have availability once a program begins, you may still join us. All late-comers will be sent all of the materials that have been sent up to that point in order to catch you up with the rest of the group. Some mysteries may suggest a special tool or ruler, but are never required. We will offer these tools at a discount to Club members, and will provide a list at the beginning of each quarter. As always, you can be confident that the fabrics you receive from Homespun Hearth are 100% top quality fabrics from your favorite manufacturers, including Moda, RJR, Hoffman, Red Rooster, just to name a few. The mysteries have been tried and tested, so each quilt will go together with ease ... and just when you think you've solved the mystery, you will be thrown off scent once again! Each mystery includes all of the fabric required to complete the quilt top, including borders, binding, complete and easy-to-follow cutting and sewing instructions, and a 10% discount on your backing fabric if you purchase with your kit. Payment for the program is broken into 3 payments - each includes 1/3 the program fee, and payment #2 & #3 also include shipping costs for that section. please note - shipping costs may change if/when USPS changes pricing or for special shipments such as flannels. Shipping costs for International will be determined based on actual cost to ship fabric and weekly mailers to customer's country. One Day Mysteries - These mysteries are Free Events offered ONLY at Homespun Hearth! Throughout the scheduled day, clues will be released that will be quick and easy to follow. Please note - Once the Mystery Day has passed, that particular mystery will no longer be a free download, but will still be available purchased. Step One - Prior to the One Day Mystery- To participate in the One-Day Mysteries, prior to the date of the event, add that One-Day Mystery to your cart (ie: Superbowl Mystery, Valentines, Day Mystery, Worldwide Quilting Day Mystery, etc) and then check out. You will also have the option to purchase a mystery fabric pack to go along with your One-Day Mystery. There will not be any charge for the Mystery (there is, of course, a cost for the optional fabric pack), but once your order is complete, you can go to your account and download the initial fabric and cutting instructions. Step Two - Day of Mystery - On the day of your mystery, the clues will be added to your account at different intervals during the day. You simply go to your account throughout the day and download your mystery steps. Generally 1-5 steps, the quilt can generally be completed within a day .... some days are longer than others. Step Three - Enter to Win - After each mystery, we hold a drawing for 1 -3 people to win various prizes. Simply email an image of your completed quilt top (quilting and binding not required) to home@homespunhearth.com, and your name will be entered into that mystery's random drawing. It's as simple as that!